You don't have to be a professional artist to have fun with fabric paint. With a few simple supplies and a little inspiration, you can create spectacular projects you'll love. What's more, these fun designs each use different techniques that will allow you to perfect your fabric painting skills so you can come up with more great ideas of your own. 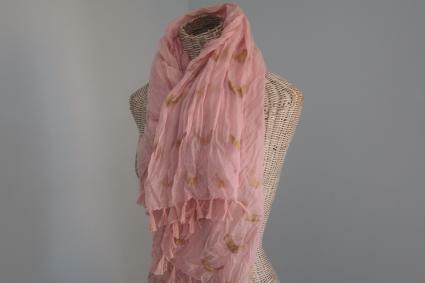 You can put your own personal stamp on any plain scarf you buy at the discount store. All you need is about an hour of your time and some basic supplies. Spread plastic over your work surface to protect it from damage. A trash bag works great for this. Lay the scarf on top of the plastic and pour some of the fabric paint onto the paper plate. Fold the makeup sponge in half, and use the scissors to cut it at an angle, starting from the middle and going up. Then make a second parallel cut about half an inch down from the first. Keep the middle chevron shape and discard the rest. 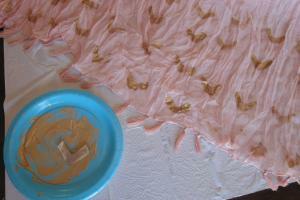 Dip the chevron sponge in the fabric paint and then place it on the scarf. Lift straight up, and dip it again. Place another chevron next to the first. Continue placing chevrons until you're happy with the design. A good choice is four rows of chevrons on each end of the scarf. Don't worry about getting them lined up perfectly or avoiding wrinkles; this shouldn't look perfect. When you're done, allow the scarf to dry according to the fabric paint instructions. 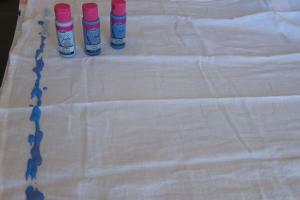 You can purchase plain white cheesecloth kitchen towels at any home store and then dress them up with fabric paint. Each towel will take about 20 minutes to complete, plus drying time. You can even make a set of them to give as a hostess or housewarming gift. Cover your work surface in plastic, and spread the kitchen towel out on top of it. Squirt the darkest color of fabric paint along the center edge of the towel. Squirt the middle color on either side, allowing the colors to overlap a bit. Squirt the lightest color on each end, again letting the colors overlap. Firmly holding the edge of the towel in one hand, drag the foam brush through the paint and straight across to the other end of the towel. Allow the brush to skip a little as it crosses the fabric. Repeat this process to distribute all the paint across the towel. Allow the towel to dry according to the instructions on the paint and wash as directed. It's easy to find plain onesies at any baby shop or discount store, and you can personalize them with this easy and fun fabric painting project. 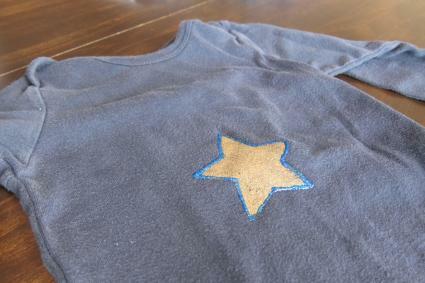 You'll use two kinds of fabric paint for this design, which will take you about half an hour, plus drying time. Tear off a small piece of waxed paper and place it on your work surface. Put the cookie cutter on top of the paper, and use the marker to trace around it. 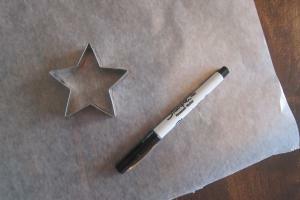 Remove the cookie cutter, and use the scissors to cut out the center of the star. You now have a stencil. Place the star stencil on top of the onesie in the location you want. Use masking tape to secure it to the fabric. Pour some gold fabric paint on a paper plate and dip the pouncer in it. Dab the paint on the onesie by moving the pouncer straight up and down. When the star is complete, carefully remove your stencil. 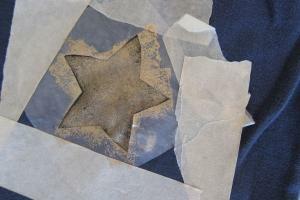 Use the dimensional glitter paint to trace around the outside of the star. If desired, you can add a personal message in the dimensional paint as well. Allow the onesie to dry thoroughly. Painting is a great way to add unique style to purchased fabric items like clothing, accessories, and home decor. 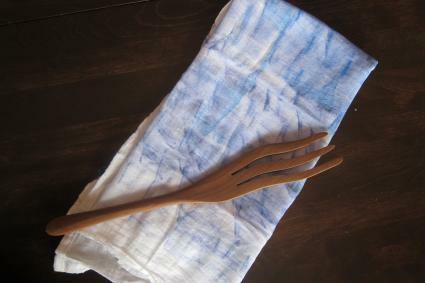 Once you've finished with these three fun projects, you'll know how to use fabric paint to embellish anything you want.